“Using Impact Assessment to Achieve the SDGs in Asia” will be held 1-3 October 2018 in Kuching, Malaysia. This symposium will target how voluntary IA tools and techniques, such as sustainability assessments, life cycle assessments, risk assessments, and materiality analysis, can be utilized in a region where regulatory efforts around IAs continue to experience challenges, with both the private and public sector arguing against further investment and business regulation. "SIA in Conflict Zones in Southeast Asia: Approaching Sustainability and Understanding Power." Register as soon as possible – courses will be cancelled if they do not meet their minimum number of attendees by 20 August. Registration for all attendees is open through 7 September. A limited number of rooms have been blocked at a discounted rate at select hotels. Please be sure to book directly with the hotel as soon as possible, as the spaces may fill quickly. Rooms should be booked by 15 September at the conference hotel to take advantage of the discounted rate. Sponsorship opportunities are available for this symposium. Download the prospectus for more information about how to get involved and the benefits of being an IAIA symposium sponsor. Thanks to Chiba University of Commerce for their confirmed sponsorship. IAIA is offering a 12-week online Foundation Course in EIA that will be open from 17 September through 7 December 2018. Participants will be able to start and complete the course within this period, depending on how they plan to use their time to go through the content and their scheduling of the video conferences with their trainer. Applications for the course are due 20 August 2018. The Foundation Course in EIA is the first in a planned series of online courses as part of IAIA’s Professional Development Program (PDP). It is designed for early-career professionals with some EIA experience and covers the basic principles and objectives of EIA, its core concepts and methods, and the fundamentals of EIA review processes and study management. The course adopts a comprehensive definition of “environment” to include the physical, biological, resource use, social, cultural, health, and economic dimensions of the project environment. Each course participant also receives personal support from an experienced IAIA trainer, especially through several online video conferences. The course should take about 20-30 hours to complete, and the cost is US$550. On 21 August you have the opportunity to participate in a free 2.5-hour webinar demonstrating the new National Environmental Screening Tool by representatives of the South African Department of Environmental Affairs (DEA). The webinar, organized by IAIA and its South African affiliate, IAIAsa, will walk users through the steps required to put in an application, what the many buttons and tabs represent, and how it is used to successfully achieve the end goal of generating a report. A Q&A session will be held during the final 30 minutes. Click for more information and to register. Hello IAIA members, colleagues and friends: The job posting for IAIA’s next Executive Director is live! Please view and share the posting from Career Central, Indeed, Idealist, or LinkedIn. Thank you to all of IAIA’s Board members who have worked diligently and intensively to shape the next ED’s role and the growth strategy it advances. Thank you also to our HQ staff who have provided support, ideas and feedback to shape the role and strategy. The appointment of IAIA’s next ED comes at an exciting time of opportunity for our association. The appointment presents an important chance to position IAIA in closer proximity to major partners, sponsors and associated organizations while enhancing our visibility and global presence. We know that many of you will be interested to know more about the recruitment and next steps for IAIA. We will hold a webinar on Thursday, 23 August, 9:00am (CDT) for IAIA members only. This will give interested members a chance to ask questions and discuss the future of IAIA with Board representatives. Members, watch for an invite via email soon. We hope to see you online! Please circulate the posting far and wide, helping us to locate the very best person to lead IAIA’s future. IAIA is now accepting applications for its next round of Innovation Grants. The purpose of the Innovation Grants is to encourage innovative, short-term projects (12 months or less) to advance the strategic direction of IAIA. Applications will be accepted through 13 September from any current IAIA member, Section, Branch, or Affiliate. A small number of grants will be given ranging from USD $2,000 to $5,000. Complete guidelines and application instructions are available at http://iaia.org/downloads/Innovation-Grant.pdf. 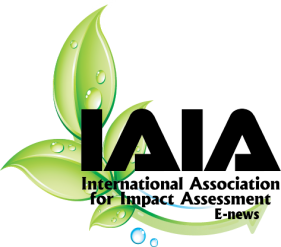 “Social Impact Assessment: Guidance for Assessing and Managing the Social Impacts of Projects” by IAIA members Vanclay, Ana Maria Esteves, Ilse Aucamp, and Daniel Franks is now available in Portuguese at http://www.iaia.org/uploads/pdf/Guia%20Impactos%20Sociais_pt.pdf. This project was an initiative of APAI (Associação Portuguesa de Avaliação de Impactes (IAIA’s Portuguese Affiliate. Special thanks to GALP, João José Martins, Ana Maria Esteves, Carlos Nuno, José Pedro Vieira, Frank Vanclay, and Inês Lourenço for the translation and review. An IAIA special symposium, “Improving Impact Assessment and Management in the Mining Sector” will be held 4-5 December 2018 in London, UK. How can we improve upon existing impact assessment and management processes and practices currently used in the mining sector? This symposium will highlight emerging issues in the sector and will use case studies to identify key challenges and solutions. Mining companies, regulators, financial institutions, environmental and social consultants, and civil society representatives will come together to discuss critical and emerging issues in the mining sector. IAIA will use the information, case studies, and lessons learned from this forum to prepare a practical guide for conducting impact assessment and management of mining projects. See http://conferences.iaia.org/mining18/sessions.php for a preview of sessions, and read more about the pre-symposium Human Rights training course here. Registration is now open at http://conferences.iaia.org/mining18/registration.php. IAIA is grateful to the following organizations who have pledged their financial and in-kind support of this symposium: European Bank for Reconstruction and Development (EBRD); Centerra Gold; ERM; Golder; Lydian Armenia; Intergovernmental Forum on Mining, Minerals, Metals, and Sustainable Development; and SLR Consulting. Abstract submission will open in mid-August and will close 19 October. If you plan to submit an abstract, check out IAIA19 session submissions to see what topics are available! Sponsorship opportunities are available for IAIA19. Download the sponsorship opportunities brochure to learn more about sponsor benefits and how you can make your company visible at IAIA19. Thank you to the following organizations who have already committed to sponsor IAIA19: Tourism and Events Queensland, Brisbane Marketing. UVP-Gesellschaft e.V. (German Affiliate), is holding a conference on “Fit for the future with environmental assessment - new law and new fields of action,” 26-28 September 2018, in Goslar, Germany. See http://www.uvp.de/de/14-uvp-kongress-2018 for more information. Ontario Association for Impact Assessment (OAIA): “Planning and Protecting Water Resources: Emerging Issues, Approaches and Technologies” will be held 17-18 October 2018 in Toronto, Canada. With technological advancements, improvements in our use and understanding of scientific and Indigenous knowledge, policy enhancements, climate change, cumulative effects, regional and strategic EA and increased public scrutiny, EA practitioners are facing emerging water-related issues in EAs at an ever-accelerating rate. This year’s conference will explore these issues. For more information, visit www.oaia.on.ca. Associação Brasileira de Avaliação de Impacto (ABAI), IAIA’s pilot Affiliate in Brazil, will be holding the Brazilian Congress of Impact Assessment (CBAI), 22-26 October 2018. See http://avaliacaodeimpacto.org.br/evento/ for more information. The 30th Annual Conference of Environment Institute of Australia and New Zealand (EIANZ 2018) will be held at the Hilton Hotel, Sydney, 1-2 November 2018. The Conference theme is “Imagine! Environment, people, future,” and the event will attract over 400 delegates working within and outside the environmental sector in both Australia and New Zealand. For more information on the program or registration, please visit the website.